Google’s new open source language parser, SyntaxNet, seems to be nearing human levels of sentence parsing. Trained human linguists can parse sentences with 97% accuracy, SyntaxNet can parse them with 94% accuracy… basically SyntaxNet is halfway there. If it doubles in efficiency twice, it will surpass humans. When it surpasses humans, how far will we be from general strong artificial intelligence? That’s hard to say… but if you combined the work being done on Go, language parsing, robotic movement in real space, and other areas it seems like we are very, very close. Possibly less than five years…. Everyone I know is now addicted to the Internet. Laurel and I have our phones out all the time, or we watch Netflix together, or read books on our Kindles, or work on our computers. I can’t even go to the bathroom without pulling out my phone to read Hacker News or the NyTimes. Even my old technology hating Grandpa is now addicted. His tablet is out for hours a day as he checks email and stock prices. As I drive to work, everyone I see has their phones out. Each line of cars inevitably gets held up by someone who doesn’t see the light turn green. And it will only get worse with virtual reality now becoming commonly available. SWiFT- the network all major banks use to transfer money is not secure. The issue is that state backed hackers from Russia and China will always defeat these systems because there are no repercussions to them. Basically, these hackers are the equivalent of a pirate boat rushing out into the ocean to rob a cargo boat then going back to safe harbor in their own country. We need a global government that can enforce basic laws against theft everywhere. Only then will these attacks be stopped. Deregulation in energy in the 60s and 70s broke up monopoly’s and greatly increased competition, which brought about huge energy innovations that have revolutionized that industry for the better. Doing the same thing in medical and drug fields will vastly reduce costs while improving the quality of care. It’s pretty pathetic that you can get better service in a restaurant spending $5 than you can in a medical facility when you are spending $5,000. I just finished reading the “illustrated man” by Ray Bradbury. A fascinating tale about a tattooed man whose tattoos tell stories from the future, it is a bit macabre. Entertaining though and good literature. Since I stopped drinking, my dreams many nights are vivid and terrifying. Last night I dreamed of a Deer Hunter style scenario where my wife and I were going camping in the mountains. Rifle shots started to ping around us and we were pursued by someone for quite awhile. The two most brilliant organization builders of our time. Learning management system software is a dime a dozen right now. There are so many choices competing for attention, most people wouldn’t have time to go through even 1% of them. There could be a great system hiding at the bottom of the pile that no one will ever discover because legacy systems have so much more marketing spend that they can effectively erase small competitors. But there are some small online learning platforms that really stand out. I want to talk about one of them today, that you may have read about in some of my prior posts: RomyLMS.com. I created a training delivery and tracking software for my employees with the idea that it would better organize and automate our training processes. After further research, I found that not only was our system easier to use, more streamlined, and just as functional as other LMSs, it also served a niche that currently wasn’t being addressed. I decided to invest more into this learning management system software and make it into its own business. Now that it has been acting separately from Coalition Technologies for over a month, it’s time to review its progress. While how a system looks isn’t always a great judge of how it actually performs, having a modern navigation makes software much easier to use (and particularly learning management system software that can get very complicated very fast). Since every who uses modern web applications is familiar with a certain type of navigation, mimicking this navigation already puts RomyLMS above most of the legacy systems in terms of usability. Most of the older systems look like excel spreadsheets with buttons everywhere; you need advanced training just to start training other people using these systems. 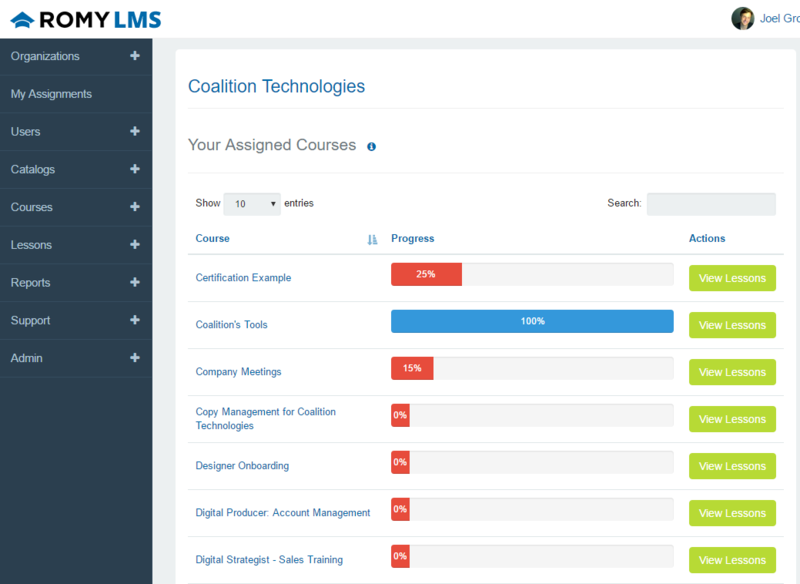 In addition to the modern UI, RomyLMS also differentiates itself from old learning management system software by keeping the list of features to the essentials. By focusing on core features, they have prevented the system from getting overwhelming and over-complicated. You’ll never get lost inside menus nested in menus found through searches and settings and on and on (this actually happened to me when I was testing other online learning platforms, and I am really tech-savy). They have also completed upgraded the reporting functionality. It is a breeze to find how an individual employee is doing on their assignments or to see how a team has performed on a test. There are also elements of gamification built into the system; progress bars, badges, and a leaderboard makes training much more appealing. RomyLMS is now a full-featured, cutting edge, learning management system that is perfect for small and medium businesses. They still have a little way to go to make the system more friendly for larger organizations, but from a programming standpoint, those changes will be fairly easy to make. I think RomyLMS is the easiest to use LMS on the market right now. If you’re interested in trying them out for yourself, you can sign up and train 5 users for free, or you can log in to their demo site and poke around.